I'll explain the underlying flaw in our economy that you should be paying attention to, and why now is the time to make some key changes to your portfolio. The ancient Anasazi moved into the American Southwest around A.D. 600. When they first built their homes in the area, the desert had not yet overtaken it. But even then, the region had little and unpredictable rainfall, just as it does today. The early Anasazi tamed the land. They built irrigation paths that captured and redirected the rain flow through the valley to water their corn, squash, and bean crops. But the irrigation had a downside. When heavy rains flooded the area, the water would cut the channels deeper into the earth into streams called arroyos. The next time it rained, it would take more water to fill the channels. The Anasazi persisted. By building dams and expanding into surrounding areas, they increased agricultural production. The main city, Chaco Canyon, no longer produced much food, but imported it from the surrounding areas. At least 5,000 people lived in Chaco Canyon at its peak. Around A.D. 1130, a drought began. The Anasazi had survived similar droughts, but not with this many people. And the arroyos were cut too deep into the earth to gather enough water to replenish the land. The boom times when water rushed through the canyon led to a booming population... But they also set the people up for their own downfall. Scholars believe that people in the outlying areas quickly abandoned the elites in Chaco Canyon, keeping their food for themselves. As told by Jared Diamond in his book Collapse, the fall of the Anasazi was "ultimately due to the same fundamental challenge: People living in fragile and difficult environments, adopting solutions that were brilliantly successful and understandable 'in the short run,' but that failed or else created fatal problems in the long run." Diamond intends for the story of the Anasazi to warn against pushing our environment too far and consuming too much. I see a deeper and wider application, because the path of the Anasazi reflects ingrained features of human nature. We make these same mistakes. As individuals and as institutions... in our personal lives... and perhaps more than anywhere, in our financial lives. I've been through "droughts" in the financial markets many times before. I sat on a trading desk during the 1987 Black Monday crash. I watched the 1989 junk-bond wipeout and the Asian and Mexican crises of the 1990s. I saw the dot-com bubble inflate and pop. I protected the wealth of family and friends through the financial crisis of 2008 – and helped them grow it afterward. What I've learned through all this is: The answer is not a line on a chart. Yes, I've got a number of indicators I keep an eye on. But every crisis and downturn evolves differently. And they all have different causes – except one, which always remains the same: The good times beget the bad. Just like the Anasazi, financial markets and businesses make the mistake of assuming tomorrow will be like today. They pounce on opportunities to grow and consume when the rains come heavy... But when the drought comes, they can't feed their families. The Anasazi loaded up on food and people. We've loaded up on debt. More than $5 trillion in corporate bonds is set to mature over the next five years. And more than $1 trillion of that rates as junk. And even investment-grade bonds aren't as safe as they used to be. BBB-rated debt, the lowest rung of the investment-grade ladder, now makes up 50% of the investment-grade market. A decade ago, it only made up 36%. You see, we've been enjoying the high-water days. With interest rates low and a growing economy pushing earnings higher, companies simply had to take on debt. It wasn't irrational. It wasn't even necessarily reckless. Investors hung money out there at such cheap prices, companies had to take it. Let's say you want to open a hotel. You borrow $10 million to build it, run it profitably, and pay down your borrowings with some of those earnings. Eventually, you have a nice, profitable hotel that you own outright. You want to buy a hotel for $10 million. You think you can earn a return of about 6% on it, but you notice you can borrow $10 million for 3%. You don't worry about paying off the debt or owning the hotel outright. Instead, you can just earn that 3% spread – or $300,000 per year. When the $10 million bond comes due, you can just borrow another $10 million to pay off the first debt. In fact, why not borrow more? Buy 10 hotels and make $3 million per year. Or 100. The more you can borrow, the more cash you collect on your spread. During the high-water times, this makes total sense. Whether you use it to buy new businesses, invest in your own, or repurchase shares, borrowing more money makes you more money. But then the drought comes. Vacancy rates rise, and nightly prices fall. Suddenly, your hotel doesn't earn 6% anymore. You try to roll over your debts, but money isn't as cheap as it used to be. And panic sets in. This is what's about to happen across our economy. Times have been good, and U.S. corporations have borrowed too much. They owe interest on that debt, making it harder to be profitable when times get tough. The arroyos have been cut too deep. According to Bloomberg, the average company has total debt equal to four times its earnings before interest, taxes, depreciation, and amortization (EBITDA). That's one of the highest levels since 2007, when the average debt-to-EBITDA ratio was nearly six times. Currently, for every $1 in EBITDA, companies have $4 in borrowing, making for a four-times-leverage ratio. If they borrow another $2, it would rise to six times. I consider six-times leverage to be highly indebted. But the level of debt is actually less concerning than the other side of that ratio... It's the earnings that worry me. If EBITDA declines 25% in any sort of a recession, leverage would go up to 5.36 times EBITDA, with no increase in borrowings whatsoever. In the last recession, EBITDA for the S&P 500 Index fell 31%. A 25% decline at some point in the future isn't just within reason... It's inevitable. So far, earnings have been growing. And most businesses can refinance debt easily when they are making money. Also, again, interest rates have been low. Lenders have granted extensions to businesses that could cover interest even if they couldn't repay the principal. Since few opportunities to earn higher yields existed, lenders figured they may as well keep collecting those interest payments. But when profits fall and interest rates rise, the constant rolling over of debt will grind to a halt. And if the default rate ticks up and credit markets seize, stocks will plummet. So while it's not time to sell all your stocks and go completely to cash... I believe it is time to start paring back on risk – especially if you are retired or near retirement age. One step you can take now is to reduce your exposure to small-cap stocks. That's because smaller companies tend to have more debt. The S&P 500 – the benchmark index for stocks, made up of large companies – has a net debt-to-EBITDA ratio of 1.55 times. The S&P 600 – small caps – has double the leverage at 3.9 times. If credit markets get shaken up, small caps will pay the price. Now is the time to move your money out of these and other high-risk investments. This is also a great time to build a watch list for bottom fishing. Start planning and raising some cash now... so you'll have the courage to buy stocks at bargain prices during any sort of collapse. Finally, if you want to know the most important changes I recommend you make to your investments during this critical time, I'm sharing a special broadcast with all the details tonight at 8 p.m. Eastern time. It's free to tune in... Join the guest list right here. Editor's note: Doc says risky debt in the market has even washed up in many supposedly "safe" mutual funds... So it's crucial to make sure you have the right kind of investments in your portfolio, before the boom times are finally over. To learn more, tune in for his online briefing TONIGHT at 8 p.m. Eastern time. If you're a retiree – or if retirement is fast approaching – you cannot afford to miss it... Click here to attend the event. "I believe the recent downturn showed us something important," Doc says. Learn how to turn the market's recent drop into opportunity right here: A Lesson in Income Investing at the Grocery Store. "We believe one thing is certain," Justin Brill writes. "When the next bear market does arrive, it's likely to be one for the ages." Read more about the huge problem likely poised to trigger the next crash right here. 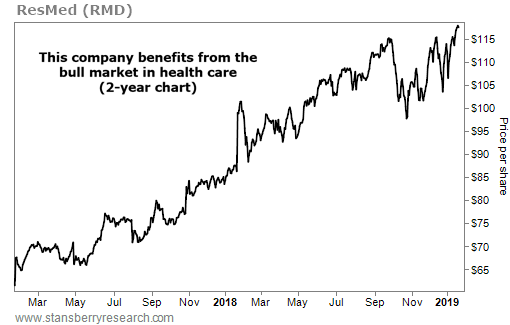 ResMed (RMD) is a $16 billion medical-device maker. It specializes in CPAP machines for treating sleep apnea, a condition in which breathing stops and starts during sleep. ResMed’s machines help users breathe easily at night. And these devices are becoming more important as Americans age… According to a study from the University of Michigan, more than half of people 65 and older are at high risk for obstructive sleep apnea (the most common form of the illness).